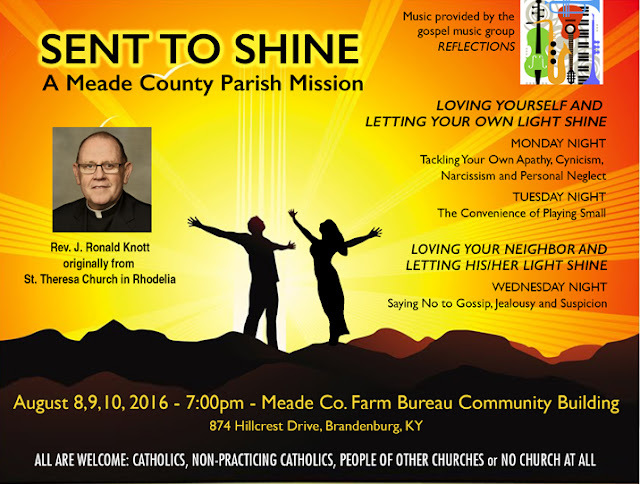 This week, I had the opportunity to return to my own home county, Meade, to lead a county-wide, three-night parish mission. Actually, we had people coming from several surrounding counties and even several people from Protestant churches in the area. We had a full house all three nights and the response was overwhelming. When I accepted the invitation, I insisted that we not sing that missalette music that Catholics have to endure on most weekends. I wanted to bring a gospel music group. Under the direction of Elaine Winebrenner from Our Lady of Lourdes Parish, we pulled one together and even gave it a name - REFLECTIONS. I chose REFLECTIONS because the theme of the mission was SENT TO SHINE. I was simply bowled over when I heard all those Catholics singing Gaither Gospel Music with only a few minutes of rehearsal. I took Sister David Clare SCN and Sister Betty SCN (her house mate) down with me on Tuesday night. Sister David Clare was principal of Cross Roads School (formerly St. Theresa School) for nineteen years. She got to meet hundreds of old students, parents and friends. Even Sister Betty ran into several people she knew. On Wednesday night, I took Phyllis (Jarboe) Drury with me since the whole event was a way to raise some money for my mission projects. Phyllis takes me to the airport and picks me up when I do priest retreats around the country as her donation to my mission ministry down in the islands. It saves a lot of money that I would have to take out of the funds I raise for the island missions. Phyllis ran into several relatives from Hardinsburg (Owensboro Diocese) at the mission that she had not seen for a while. Father Bob Ray came down on Monday night. We are both from St. Theresa Church in Rhodelia. Father Bob Abell was there all three nights, as well as Father George Illikkal CMI, the new pastor of St. Theresa in Rhodelia and St. Mary Magdalen in Payneville. Father George is from India and the people already love him. We had several permanent deacons and their wives: Deacon Mike Jones and Debbie, Deacon Joe Calvert and Bareta, Deacon Denny Nash and Theresa. Deacon Greg Beavin, and his wife Shirley, oversaw the committee of volunteers who set things up, read the Scriptures, advertised and recorded the proceedings and brought food every night for people to enjoy after the services. The Augustinian Sisters from Malta, Sisters Lucilla and Sister Theresa, who have been serving in Brandenburg for almost 50 years, were there all three nights. I have never been as proud of "my people" as I was this week. These people are the "salt of the earth" and the "light of the world" just as Jesus called us to be! They are good to the bone and many of them made great sacrifices to come out each night. They are generous people as well. After we paid the musicians and printing costs, they were able to donate $5,000 to my R J Mission Projects fund! They are amazingly generous. I love them and I am proud of my Meade County roots! and with it we curse human beings who are made in the likeness of God. Deacon Greg and Shirley Beavin. They were my hosts and main helpers during all three nights. Made County is very fortunate to have them and their generous service to the Church. I did the talking, but the musicians made it exciting and fun. They did a great job of getting people to sing a whole bunch of new gospel music that many had never heard. Let's give them a hand! Our fabulous gospel music group. The congregation on night three - another angle. Sister, brother, sister, great-nephew, cousin and friends. Each night the refreshment tables got longer. Parishes took turn. Jerry Greenwell preserved it all on tape for those who could not attend, for looking at again and for the history archives. After the musicians were paid, my mission projects in the islands made another step toward setting up my headquarters down there to receive volunteers and finishing a new chapel in the Diocesan Pastoral Center. The total being sent to the missions of SVG is $5,000. The hall is empty now, but I will be back! Out of fear I went off and buried your talents in the ground. Divine Mercy (picture behind me) is what I needed to get through my homilies! Relatives, old girl friends, neighbors and fans all came for an encouraging word. LEFT: Sister David Clare SCN was principal of Cross Roads School for 19 years. MIDDLE: Sister Betty SCN housemate of Sister David Clare. Cake made by Lorrine Yokey especially for the ocassion. Of course, a few of my books were on sale. Business was good. Jeff, in the red shirt, was keeping an eye on the money box for me. You would not believe the food the various parish members brought for people to enjoy at theend of each night's program. Amazing! A flock of relatives and friends with Aunt Mary Catherine in the center. My sister, Kaye, who is also a sister-in-law of Father Bob Ray. a way that they may see your good works and give God the glory. It was wonderful to see so many friends, family members, relatives, friends and old neighbors. It was very much like a big family reunion - all of which made me a little more nervous than usual. Our musicians with the St. Vincent and the Grenadines flag in the background. Our musicians at practice with the St. Vincent and the Grenadines flag waving in the breeze from the pulpit. SVG is the island country where I volunteer. The collection each night goes to support programs in the Diocese of Kingstown down there. The congregational singing was wonderful. Who said Catholics can't sing? That's my brother, Mark, in the middle, in the white shirt, with the wall thermostat above his head. My sister, Lois, is sitting right in front of the pulpit in dark blue top. People came from all over Meade County. Others came from Jefferson, Hardin and Breckenridge Counties for sure. Other counties were probably represented in the good sized crowd. Who said Catholics can't sit through a thirty minute sermon?" Let's pray! Let's sing! Let's let our light shine! Let's help Father Knott help the Caribbean missions! I have been at this “priest thing” almost all of my life. I have never really wanted to be anything else. I first felt “called” when I was seven years old. I started seminary at age fourteen. I was ordained at twenty-six. I have been a priest now for forty-six years. A few years back, during the beginning of the sexual abuse scandal, for the first time in my life, I actually thought about quitting. I was so angry, disappointed, embarrassed and disillusioned that I thought about throwing in the towel, moving out of state and finding a job that had nothing to do with God, the church or priesthood. I wanted to quit, but I didn’t – and I won’t! When I was in my funk, the question I kept coming back to was this one: “Where is your faith placed?” Is it in priests? No! Is it in bishops? No! Is it in the Pope? No! They are merely “earthenware jars.” They hold the “treasure,” but they are not the “treasure.” Is it in organized religion? No! Organized religion, has and will always be, in need of reform. No, to leave would be to turn my back on God. Finally, I know enough scripture to know that I cannot have God without his church, no matter how many people try to have it that way. No, to leave would be to turn my back on God. (1) How could I turn my back on the God who called me to be a priest, simply because of the gross sins of a handful of pathetic brother-priests and those who were misguided in their efforts to protect them? (2) How could I turn my back on God who “adopted” me at baptism and made me a member of his family, the church? How could I victimize my parishioners again by leaving, when it has been severely wounded and in need of nursing care? How could I go off and leave my “faith family” in its time of need? After my mind explored the possibility of leaving, after I wallowed in my depression for months, after I wrestled with the question of faith, I finally came to the realization that, if I have faith at all, then this is the time to prove it - by staying, by remaining faithful, by remembering why I am doing this to begin with! Today, Abraham is held up to us as a model of faith, and so he was! In fact, Eucharistic Prayer I refers to him as “our father in faith” because of his extraordinary ability to trust God, even when God’s promises seemed utterly impossible. Even at age 75 , Abraham did not bat an eye when God called him to leave his country, everything that was familiar to him, and head to a place unknown. He went simply because God told him to go. In his old age, when God told him that he would father a son, his first, one that he had longed for all his life, he did not bat an eye, despite all natural evidence to the contrary. Abraham and Sara were both senior citizens. When Abraham heard the news, he did not bat an eye, but believed that somehow god would do it. Sara, on the other hand, snickered with laughter when she heard the news, and worse yes, denied having laughed when God caught her. But the ultimate test of faith came when God asked Abraham to sacrifice his precious, one and only, son Isaac. Without batting an eye, Abraham prepared to kill his precious little boy in unflinching obedience, not knowing how God would keep his promise of making his descendants as numerous as the stars, if he did. Do you have faith? No, I don’t mean do you believe this or that story or doctrine to be true. I mean, do you really trust God? It's easier to believe in the Virgin Birth than it is to trust God when you have been diagnosed with cancer! Do you believe in things you can’t see, promises that haven’t been kept yet? Can you keep walking with God, even when you can’t see where you are going, even when your most precious things, relationships and assumptions are taken away from you? I am amazed at people who say they have “lost their faith” when an old church is renovated, when an altar rail is removed, a mass time is changed or when a priest disappoints them. I am also struck when I hear that someone has lost their faith over the death of a loved one or a major health crisis. I don’t know what they lost, but it wasn’t faith! If faith only holds up when things are going fine, when the world is the way we like it, when we are blessed with all that life has to offer, then it is not faith. Faith is only faith when we cannot see where we are going or cannot understand the things that happen to us, when we are swamped by doubt and confusion. It is only then do we know whether we have faith or not. If we can go on loving and trusting God, after we hear the diagnosis of cancer, then we can say we have faith. If we go on loving and trusting God, after our house burns down, we lose our job and our friends abandon us, then we can say we have faith. If we can trust God after we have lost everything we can lose, then we can say we have faith. If your faith hasn’t been tested yet, and it surely it will be, I hope you can, without batting and eye, keep on loving and trusting God in the darkness and confusion. If you can do that, then you will know whether you are really a man or woman of faith!